← Find Your Perfect Valentine! There is something special about the spring season that motivates business owners to breathe some innovation into their business routine. And what better way to do that than by adding a touch of customization into your current software, right? If you enjoy the unlimited flexibility of tailor-made solutions, but at the same time need to keep your budget in check, you have come to the right place! 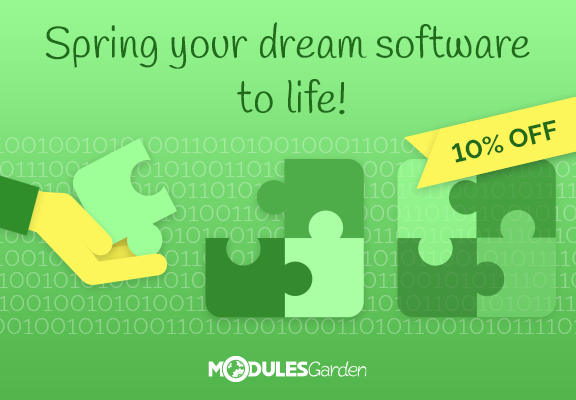 We are excited to be launching a spring-inspired 10% discount on all custom software projects developed by ModulesGarden! The promotion extends to each and every implementation paid for up until the end of April so there is no time to waste! As an extra bonus, we guarantee speedy solution delivery and the works on the project to be started in even seven seven days after request acceptance. Feel free to reopen the existing ticket if you already discussed the specifics of your bespoke implementation with our advisors at any point in the past. Alternatively, fill out this brief Custom Software Development Form and tell us all about your requirements to receive a free quotation. As you can see, beyond the standard steps there is nothing at all you have to do in order to snap up this gripping 10% discount. Just be quick and precise to maximally speed things up – we will handle the rest! Learn more about our custom software development services, leave your genius idea with us and we will turn it into a ready-to-work solution before you even know it! Not to mention the real size savings you can pick up this spring too!